In our world today, so much of the focus is on our “career”. We’ve lost a sense of the meaning of “vocation”. Most of us probably don’t even know what that word really means. There are many definitions of the word “vocation” that abound. I offer a personalized definition of that word: an outward pattern and orientation of life that stems from an intrinsic connection with one’s God-given nature and personality. Wow, that’s a mouthful! Let me try to explain in clearer words. I believe that each person is born uniquely in a way that God fashioned and intended. I believe that each person has something unique to offer to the world that only this person can. I believe that in each person there is a unique combination of things that will spark their passions and interests. What is our task as parents and those who serve young people? I believe that one of our fundamental tasks is to help them discover these sparks that will ignite their passions. This involves naming these sparks and passions. Furthermore, an additional task is to help cultivate these passions and provide space to nurture outward practice of these passions. In our society, we tend to go at it from the opposite angle: see what the “marketplace” wants and demands, then find programs that will help our children fit into what the marketplace wants. Thus, we first think of math programs, gymnastics, swimming, taekwondo, etc. And in many ways, this is the easier path because these programs are laid out for us. All we need to do is register them, enrol them and follow the schedule. We want to connect their interests with jobs and careers. We want concrete outcomes from what they pursue. It is a much more difficult task to help them discover their unique gifts, talents and abilities. This takes attentiveness and a close relationship over time. In other words, it takes discernment. This is akin to developing a relationship with God – it doesn’t happen suddenly or by our sheer willpower, but rather, it is built by attentive listening over time. When we pay close attention to our children as they are, not how we wish them to be, then we can start seeing them for who they are. We can then encourage them and support them to cultivate their uniqueness. If we put our minds to it, we will find creative and imaginative ways for them to cultivate their interests. From practice and reflection from that practice, our young people will discover a greater sense of themselves and thus their vocation in life. I believe this is how God intended things to be. Considerations of concrete careers and jobs plays a factor, but in my opinion, at a later stage, once one’s unique gifts and talents have been identified. I think we underestimate our vast economy by thinking there is only a limited range of career options. I think the economy is varied enough that ultimately, one can find a career that is close to one’s real nature. For sure, some fields may be more challenging than others, but is not life meant to be lived out according to who we are? Our youth ministry at church is dedicated to helping our youth discover their authentic, God-given selves. This ministry, however, cannot be done in isolation, because so many of the formative moments are spent at home. 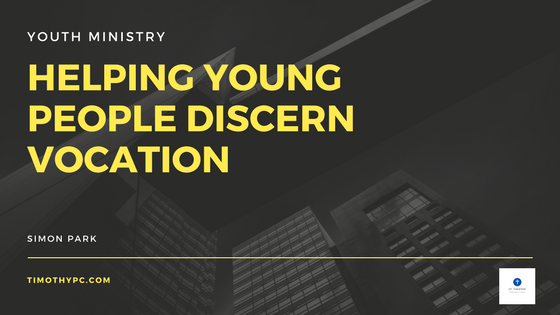 In partnership, the church and home can be powerful places of personal formation and flourishing for our youth to discover their God-given identities and vocation.